Everyone who is building their own website is going to need an image editor of some kind in order to crop and resize images that they then upload to their website. If you're using WordPress, you will have seen that there is a kind of basic image editor inside the system that allows you to crop and resize images once you've uploaded them, but actually, it's much easier to do this outside WordPress before uploading them. You also don't want to upload massive pictures to your website (which most photographs are these days, even those taken with a cellphone), as this will unnecessarily take up space in your hosting setup, so it makes sense all round to work on the images beforehand. There are some other image editing softwares around and if you have one on your computer that you're happy with, great - use it. All we're talking about doing here is cropping, resizing and using layers in a very basic way and you don't need any kind of complicated software to do that. But if you don't have any software you can use for this on your computer, I always recommend Pixlr. It works in pretty much the same way as Photoshop, but without all the bells and whistles. Pixlr is an online tool that lets you store a library of images online if you want to - there is also a downloadable version that you can install on your computer, but the online version is absolutely adequate. From the Pixlr home page, you need to choose "Pixlr Editor" to launch the app. I'll walk you through the process of creating a header image. First I open the Pixlr Editor by clicking the "Launch Web App" button for the Pixlr Editor app on the Pixlr home page. I then need to open an existing image - for this example I am using a pattern that I have downloaded from ColourLovers.com (a brilliant source for gorgeous patterns that you can even colour yourself). So I choose the "Open image from computer" option, as shown below. I navigate to the image on my computer and choose it, and it opens up in Pixlr. The next thing to do is resize the image. Imagine that my theme requires my header image to be 1600px x 300px. Your theme will usually specify what size you need to crop your header to. By the way, measurements are always specified for web graphics with the width first, so here, the width of my header is 1600 pixels. Something important to know when resizing images for a website, especially headers as they are usually very wide, is that you can't make an image bigger than the size you originally have it - it will distort and be of horrible quality. So make sure you use an image that is already as big as you need it to be, or bigger. This isn't an usually issue with digital photographs (or scans for that matter) as they are usually huge. But if you are using a photo from an image library, for example, do check you have downloaded a large enough version. 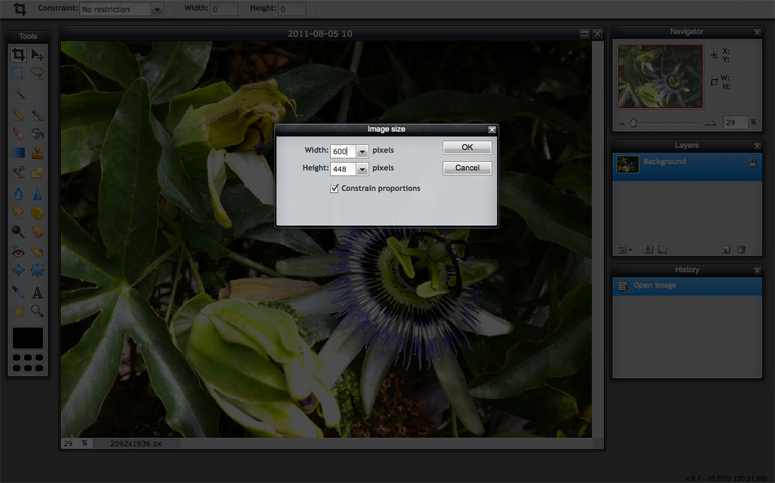 You can see that the crop tool is selected in the toolbox on the left, and that the size of the selected area is shown on the right hand side. If, once you've selected an area the right size for your header, you feel you haven't selected quite the right area, without clicking anything else, you can click within the selected area and use your mouse to reposition the selection, keeping it at the required size. When you've moved the selection to exactly the right place, click anywhere else within the screen. A query box will come up; click "Yes" to apply the changes and crop the image - that is, if you're happy with the selection you've made. Pixlr will now crop the image. Don't worry if you make a mistake at any point - it's easy to go back a step, without having to start over again; just click the previous step in the History pane to the right (which you can see in the screenshot above). At this stage you might be happy with what you've done and if so, you can save the image. However before saving the image, I want to show you something else that introduces you to the idea of layers in images. It quite often happens that you want to add writing on top of a header image (or any image for that matter). Usually it works well to add writing in white, but in order for it to be easily legible, you will want to darken the original image a little. How to do that that is to add a partly transparent texture as a layer. Let's see how that's done. I move the black texture to the right by grabbing the black bar at the top of the image - it's impossible to see what we are doing otherwise. I then drag the black background layer from the Layers pane onto the image of the flowers as you can see in the two screenshots below. OK, so we now have the black background on the flowers, but it isn't big enough. We want to duplicate the layer so we can use it to cover the remaining space. 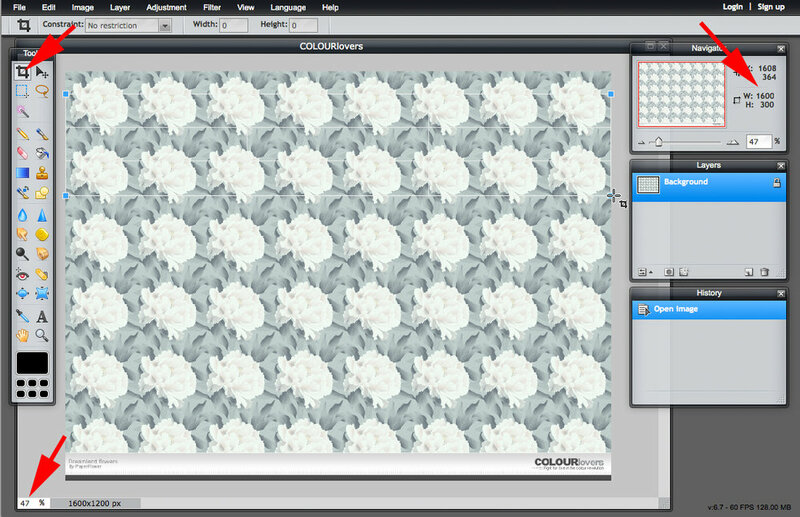 Right-click on the black layer in the layers pane of the flowers image, as shown, and select "Duplicate layer." Now, select the Move tool from the toolbox on the left - it's the little cross at the top right. 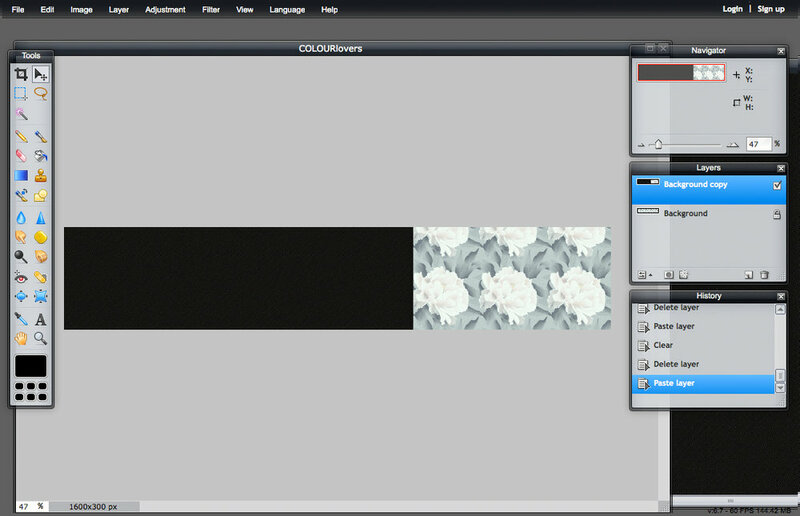 Having selected it, use your mouse to move the second layer of the black texture to the right, so that the black texture completely covers the flowers. The Move tool is indicated at the top right of the toolbox. Now we want to join the two dark layers together so that we can make them partly transparent at the same time. Right-click on the top dark layer in the layers panel and choose "Merge down." This will make the two layers one. Now to add some transparency. Click the tiny button at the bottom left of the Layers pane; an Opacity slider will appear. Slide it to about 35 and you'll see the flowers becoming visible underneath the dark texture. This is dark enough for my white lettering to show up, so I am ready to save the image. Name the image however you want to name it, slide the Quality slider up to 100 (keep an eye on the file size - it's above the "OK" button - you want to make sure it is under 1MB) and save the image to your computer. 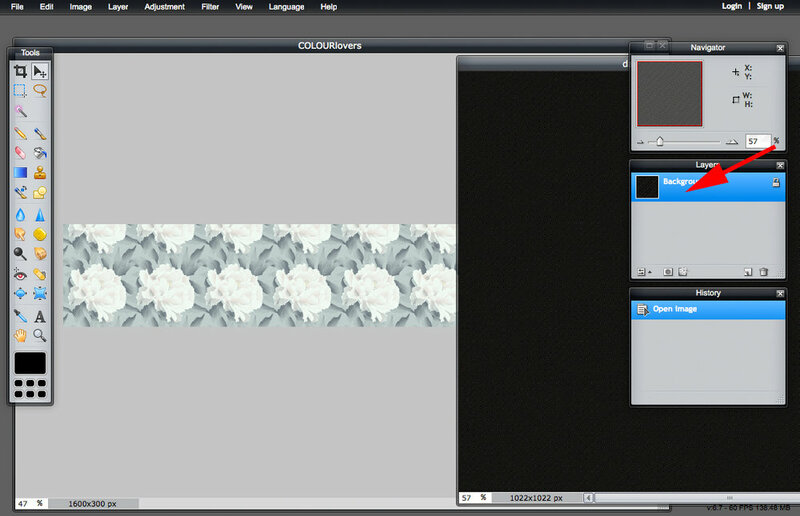 You now know how to create a header in Pixlr - as well as how to crop an image, and the basics of layers. There is just one more thing I would like to tell you before we finish this tutorial, and that's how to resize an image. First of all, open the image that you want to resize and crop it just as we did above, using the Crop tool, so you have the image the way you want it, even if it is too big overall. So, with the image open and cropped the way you want it, click on "Image > Image size" from the Pixlr menu as shown. Now, change the measurement in the "Width" field to the width you want the image to be - in this example, 600 pixels. Make sure you keep the "Constrain proportions" box checked, as you want the height to change automatically, so that the image keeps the correct proportions. Don't write anything in the "Height" field - the software will do it for you. When you click the "OK" button, you'll see that the image jumps to a smaller size - don't worry if this looks tiny as you're just seeing the image at the same scale it was viewed at before. (You can check it in the bottom left corner and if you like, just to check, you can type "100" there so that the image jumps to its correct size. This won't make any real difference though - you are only changing the way you are viewing the image.) All you need to do now is save the image, just as we did with the header. Supposing the height is now smaller than is should be, change the height to what it is supposed to be and let the width size itself accordingly. Now, create a new blank canvas that is the same size as the desired image size. Choose "File > New Image" and in the box that appears, type in the desired size of the image, as in the example below. (Just ignore the Presets dropdown.) Click OK.
Now click the original image and drag it to the right if needed, so that you can see both the images at the same time - the original, resized picture, and the new blank canvas. Drag the original image (clicking and dragging the Background layer in the Layers pane) onto the new, blank canvas; use the Move tool to adjust the positioning if necessary.